The leader of the unsanctioned Catholic Church in China had joined the Jesuits in 1938. After two decades of government imposed house arrest, Shanghai’s Vatican approved bishop, Joseph Fan Zhongliang, SJ, has died. Few Catholics outside of China knew that Bishop Fan was Shanghai’s ordinary, and even fewer in China knew this fact. The recently deceased Bishop Aloysius Jin Luxian, SJ, was actually the auxiliary bishop to Bishop Fan (see “The Death of China’s Most Famous & Powerful Bishop” [April 30, 2013]), and Bishop Thaddeus Ma Daqin, also an auxiliary, is still under house arrest for his refusal to remain affiliated with the Chinese Catholic Patriotic Association. Bishop Fan, who joined the Jesuit order with Jin Luxian in 1938, died late Sunday evening. He was consecrated the coadjutor bishop of Shanghai in 1985, and was recognized in 2000 as the ordinary of the Diocese of Shanghai after the death of Cardinal Ignatius Gong Pinmei, the famous leader of Catholic resistance to the Communist Party during the early 1950s. Bishop Fan was the leader of the unsanctioned Catholic Church in China, and he spent most of his tenure as Shanghai’s bishop under constant surveillance; with very few exceptions he was denied visitors. Unofficial sources from the “underground” Catholic community have reported that after Fan’s death, government officials removed his bishop’s zucchetta, affirming the state’s denial of his status as Shanghai’s legitimate bishop. After pressures from the Catholic community, however, the government has agreed to allow the faithful to pay respects to Bishop Fan for two days. Bishop Fan was among those Jesuits in Shanghai who were arrested in 1955 and subjected to continuous interrogations and pressured to make a statement of support for the new government. Fan refused, and was sentenced to decades in labor camps and prisons. He and Bishop Jin Luxian were released in 1979, after which Fan taught for a high school. 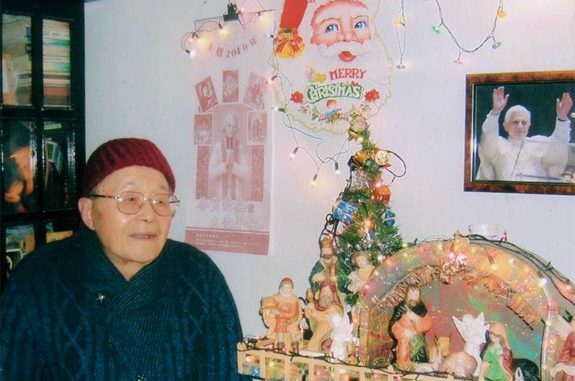 Fan lived in a small apartment after being made a bishop in 1985, until Public Security Bureau officials ransacked his home in 1997, seizing his bibles, liturgical books, and his funds used to support the activities of Shanghai’s unsanctioned Catholic community. Throughout his life, Bishop Fan remained a symbol of Catholic loyalty to the Church, and a devoted member of the Society of Jesus. Fan’s passing marks the end of the generation of Chinese bishops in Shanghai who lived through China’s transition to a Communist country. A small Requiem Mass was offered in Bishop Fan’s apartment before state authorities removed his body to a funeral home.